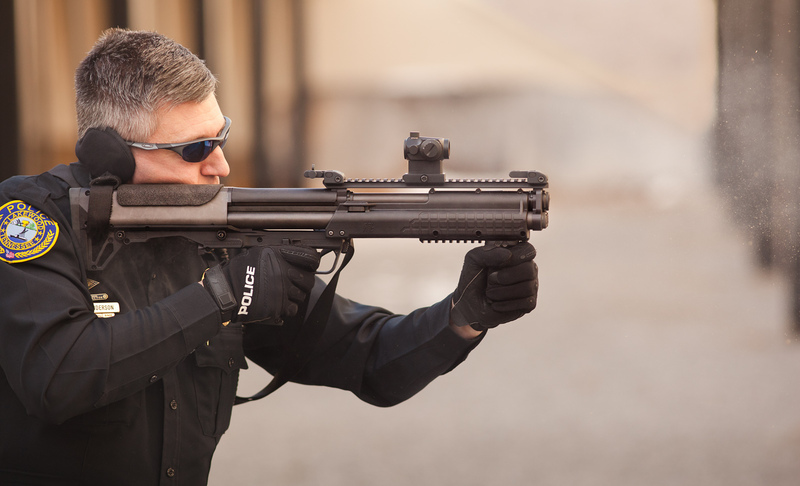 Kel-Tec KSG Shotgun: 15-Round (14+1) Bullpup Pump-Action 12-Gauge Combat Shotgun for Urban Tactical Operations and Applications (Photos and Video!) | DefenseReview.com (DR): An online tactical technology and military defense technology magazine with particular focus on the latest and greatest tactical firearms news (tactical gun news), tactical gear news and tactical shooting news. 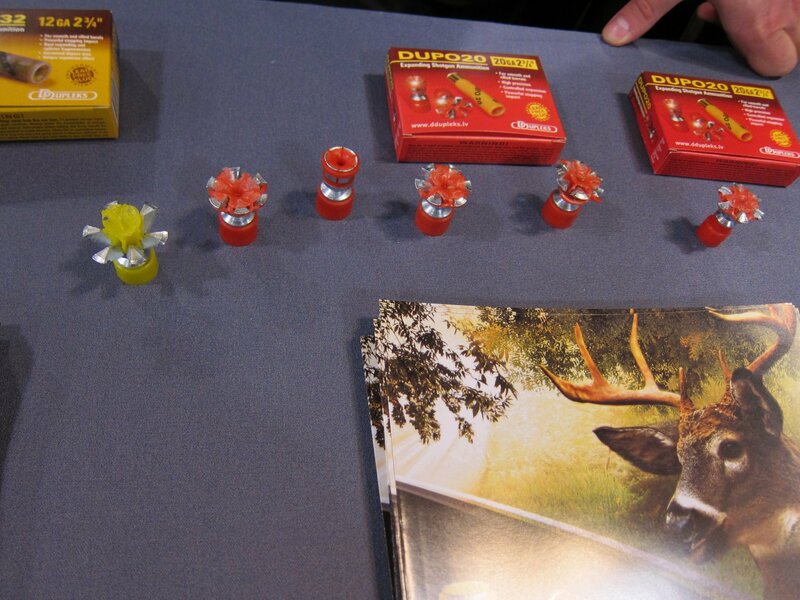 The top photo and fifth photo (D Dupleks shotgun slug ammo) contained in this article were taken by Canon PowerShot S90 10-megapixel digital camera (still camera with video capability). The rest of the photos contained in this article are courtesy of Oleg Volk Advertising Photography, and these are also copyrighted. DefenseReview (DR) recently got to view and handle the Kel-Tec Shotgun (KSG), a 15-round (14+1 round) bullpup pump-action 12-gauge (12ga) combat shotgun, briefly at SHOT Show 2011, and we came away very impressed with it. The KSG can hold 7-rounds per tube, and the mag feed switch procedure is made via a manual lever located behind the trigger guard, rather than by an automatic mechanism. Once one tube mag goes empty, you’ve got to manually switch over to the second one. 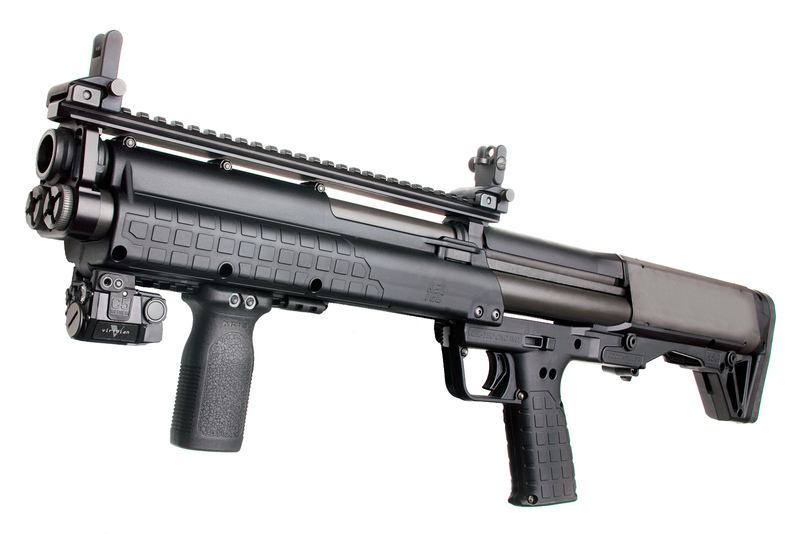 In the interest of full disclosure, one could argue that Defense Review was predisposed to like the KSG shotgun on sight, since we’ve been longtime fans of the South African Neostead Shotgun, now made by Truvelo Manufacturers (Pty) Ltd. One could argue that the KSG bullpup shotgun is essentially a modified, updated, Americanized, and arguably significantly improved version of the Neostead bullpup shotgun concept. Both shotguns are bullpups, utilize a dual-tube magazine setup (i.e., a double-tube-magazine-fed design), are pump-action operated, and make extensive use of weight-saving polymer (plastic) in the stock/receiver and forend. However, there are some major differences. First, the KSG’s pump action is cycled in the traditional manner, where the forend pump handle is pulled rearward, just like on the more traditional Remington 870 and Mossberg 500 and 590 Special Purpose shotguns. By contrast, the Neostead operates via a forward-push pumping action. Also, on the KSG, Kel-Tec positioned the dual-tube magazine below the barrel, which allows the KSG to offer an almost full-length Mil-Std-1913 “Picatinny” top rail system for mounting front and rear BUIS (Back Up Iron Sights); combat optics, including standard optical sights (like an EOTech 550-series or EXPS-series HWS or Aimpoint CompM4 or Aimpoint Micro T-1, for example); and night vision (NV) and thermal/IR (infrared) weapons sights. 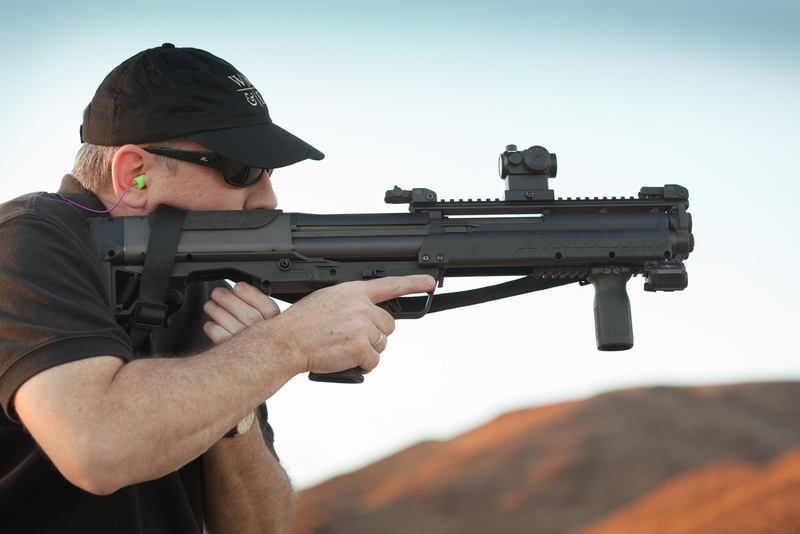 The KSG also features a picatinny bottom rail for mounting a vertical foregrip. A picatinny rail has become de rigueur and a required feature on modern combat/tactical long guns (rifles/carbines and shotguns) in the last decade or so. The Neostead mounts its two magazine tubes above the barrel, seeming to preclude the integration of a picatinny rail system (unconfirmed/unverified). Finally, the KSG has a higher total ammo capacity than the Neostead: 15 rounds (KSG) vs. 13 rounds (Neostead). DefenseReview had hoped that the Neostead folks would get their act together at some point and manufacture the Neostead Shotgun here in the States. The closest this ever came to happening was a number of years ago when there was a chance that Ithaca Shotguns might make it–but it wasn’t to be. DR handled a prototype Neostead Shotgun inside a private room at the Ithaca booth at a SHOT Show we can’t remember the year on, and we really liked it. The gun looked and felt good. With the arrival of the KSG, America doesn’t need the Neostead, anymore. 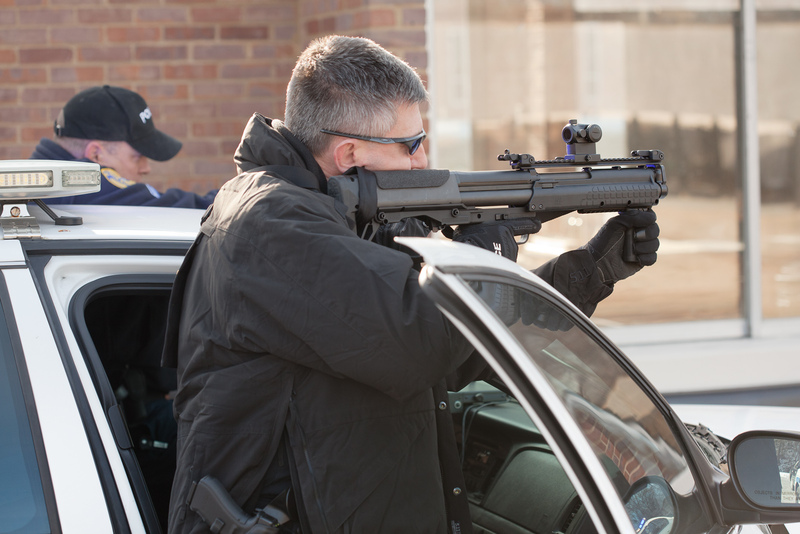 It would be interesting to see if side rails (at 3 and 9 o’clock) can be effectively utilized on the KSG’s pump handle for tactical white lights and lasers. This is complicated, of course, by the fact that the forend on a pump-action shotgun moves and needs to be grippable, unless a vertical foregrip is employed. If side rails are added and you want to use the weapon without mounting a vertical foregip, rail panels will have to be utilized. Rail panels would just add some girth to the forend. As long as your hands are large enough, no problem. The only caveat now whould be how the forend’s movement when pumped affects any of the accessories that are mounted on it, or their tactical employment. Post SHOT, we’ve received some very feedback on it from our friend Oleg Volk and a friend of his, patent lawyer Glenn Bellamy of Wood, Herron & Evans, LLP, both of whom appear to be very impressed with it. While it should be noted that Kel-Tec is one of Oleg’s photographic services clients, it’s Defense Review’s experience with Oleg that he’s always been honest in his assessment of the products he photographs, and he seems genuinely impressed with this one. According to both Oleg and Glenn, the KSG prototype they test-fired out in the desert was very sturdily built, so it should prove combat-durable. Mr. Volk has informed DR that the Kel-Tec KSG tactical shotgun accepts both 2.75″ AND 3″ Magnum 12ga shotgun shells, so we’re curious as to whether or not the KSG will be able to successfully fire and cycle FRAG-12 genade rounds, which are still undergoing development, but are rumored to be close to going Prime Time. The Kel-Tec Shotgun should definitely be able to fire and cycle both HEVI-Shot shotgun ammo (of which AA-12 full-auto shotgun designer/developer Jerry Baber is a big fan) and the new D Dupleks Hexolit 32S controled-expansion 12ga steel shotgun slug, which Defense Review also got to view and handle at SHOT Show 2011. The Hexolit 32S shotgun slug is one scary-lookin’ shotgun slug! MSRP on the Kel-Tec KSG high-capacity bullpup pump shotgun is expected to be in the $800 range, which is very affordable for what it offers. 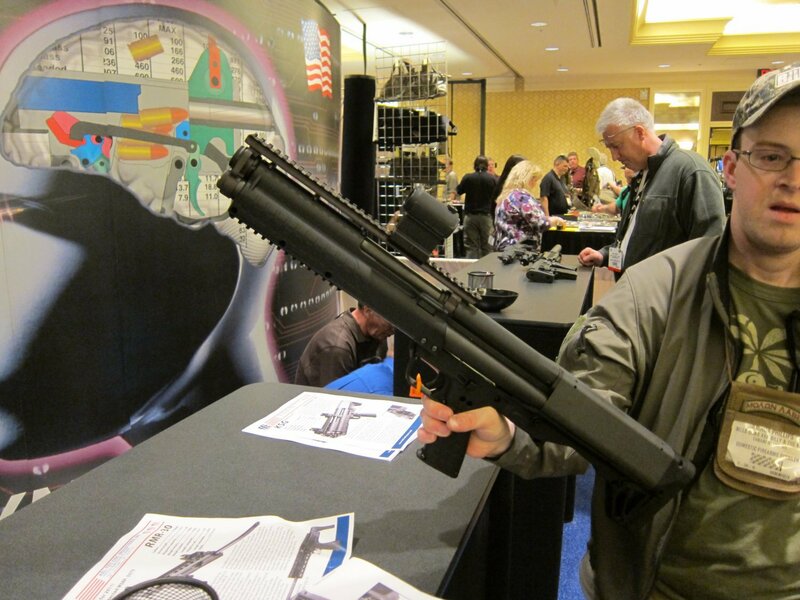 DefenseReview looks forward to getting a KSG in our hot little hands for the purpose of conducting our own T&E. In the meantime, the afforementioned Glenn Bellamy Esq. 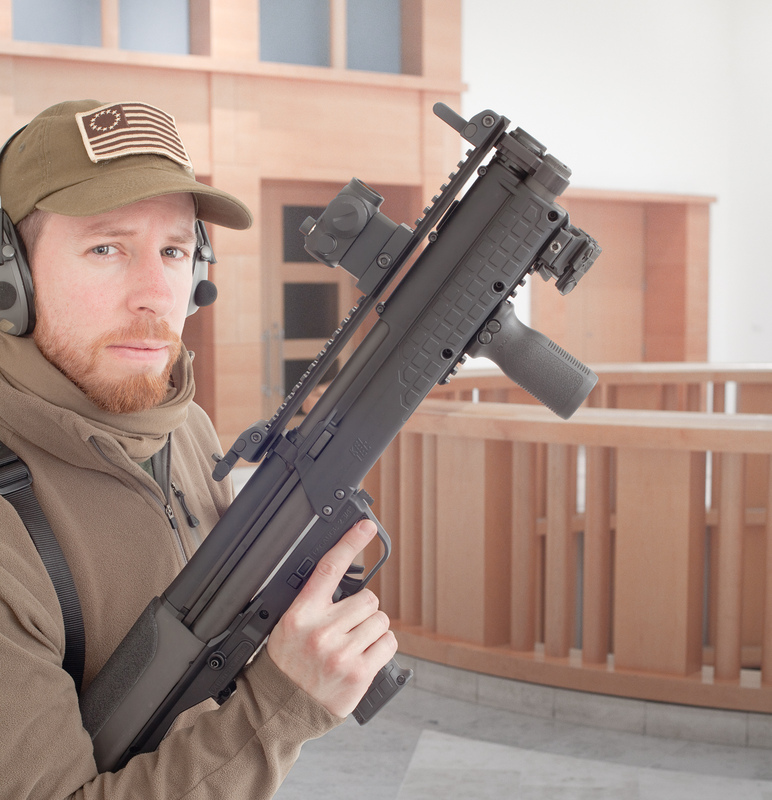 was kind enough to write a quick review of his recent experience with the Kel-Tec KSG shotgun (prototype) for DefenseReview. You can read it below the following embedded video clips, which were shot by Oleg Volk. On the Monday before SHOT Show 2011 opened, while others were invited to the official Media Day shoot, I had the rare privilege of handling and shooting the new Kel-Tec KSG shotgun. Oleg Volk, the photographer known for his work in the firearms industry as well as Second Amendment advocacy posters, needed a model for some promotional pics and video he was producing for Kel-Tec and other clients. We went out – well beyond cell phone coverage range – in the Nevada desert against a foothill backstop where I got to put it through its paces. This is no ordinary pump shotgun. The first thing you notice, of course, is the twin tube magazines. Next, is the bullpup configuration. Holding it fully loaded (7+7+1 rounds) out at arm’s length, like a typical pump, would be quite a challenge. But the bullpup design puts the center of gravity at about the position of the pistol grip and lets you support the weight close to your body. It loads and ejects through the bottom, behind the pistol grip. I put at 50-75 rounds (mostly birdshot, some slugs) through it getting familiar with its manual of arms and then posing for stills and life-fire video. It’s unlike any shotgun most people are used to using, so I took some time cycling the mechanism, operating the safety and magazine lever, and getting the “feel” of it. And it felt good. Does it automatically switch from one tube, when empty, to the other? No, you have to manually switch it. The switch lever is on the bottom, behind the pistol grip, at the front end of the ejection port. It has three positions: one for each tube and a center position for the chamber only. Isn’t that an inconvenient place for it? Well, compared to what? There aren’t many guns that have a manual switch for multiple integral magazines, so it’s not like you are already used to a different design or location. It has to go somewhere and the laws of mechanics limit the practical options. I found it most comfortable to operate the magazine switch with my off hand while maintaining sights on target and hold the weight of the gun with my strong hand on the pistol grip. The bullpub design puts the center of gravity right there and balances nicely. Can you switch magazines before one is empty? Sure, switch back and forth as many times as you like. You could put buckshot in one tube and slugs in the other, if you wanted to. I would not recommend introducing “less lethal” rounds into the mix, though. Too much chance of unintended consequences. Is it hard to load? No, not once you are familiar with it. It would not be easy to “speed load,” in my opinion, like some 3-gun champions can do. But given its likely uses (tactical and home defense), if you still have a problem after fifteen rounds of 12 gauge, you already had an extraordinary situation on your hands before you pulled trigger even the first time and better be reaching for your rifle. Are the empties ejecting down behind your strong hand an issue? It wasn’t for me or the others shooting it that day. I really don’t see why it would be a problem. I’ve seen videos where it appears to misfire. Is that an issue? It wasn’t for me. The action is smooth and failure-free. If you “short stoke” it, it won’t chamber a round – just like any other pump shotgun. The model I shot had a vertical foregrip (attached to the integrated bottom Picatinny rail), which helps you avoid this operator error. I think an angled forward grip (like a Magpul AFG) would be even more comfortable. I’ve seen on YouTube where if you hold the trigger while you work the action, it doesn’t reset, right? I didn’t have that problem. I familiarized myself with how to run the gun (one of only a few a pre-production prototypes) before using it—and would train/practice a lot more before using it for self defense or in a tactical situation. If this is a genuine problem, I expect it will get worked out before the system goes into production. If that’s the best genuine criticism of the KSG, I’d say they did pretty well. Remington VERSA MAX Synthetic Semi-Auto 12-Gauge Shotgun with Self-Regulating Multi-Load VersaPort System: Is this gas-operated shotgun reliable enough for military combat? Only one way to find out. Auto Assault-12 (AA-12) Full-Auto Machine Shotgun/FRAG-12 High-Explosive Round Combo/Weapon System?